The February Gazette was the first with its new Editor, C.E.Bailey, whose name is shown on the header above. He was elected to be the Anerley’s chief scribe at the A.G.M held on the last day of January 1914. In this February Gazette we learn that the venue of the A.G.M, the Alhambra at West Croydon, was chosen because the live-in Publican, W.H. Moon, was and had been for many years, an active member of the Anerley. (In later years W.H.-Bill – Moon drew some excellent illustrations for the Anerley B.C history as well as writing up the sections covering the 1920s and 1930s). Since the 1880s Purley Corner (where Tesco now is) had been a start point for Club Rides. 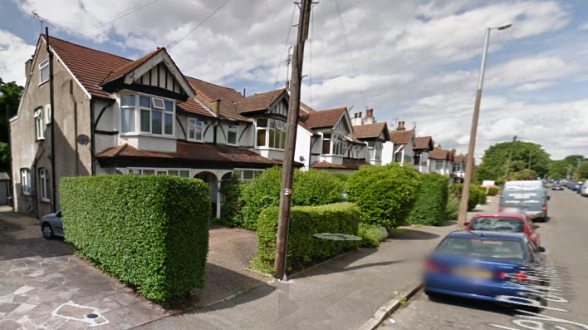 Another historic connection with Purley is that Bailey, the new Editor, lived at 15, Purley Park Rd. If he were still alive today he would be very pleased to know that his road is now part of the Croydon Cycle Network, but not so pleased about all the parked cars! Do we have any long serving Anerley B.C. officials? Well we could put Meike forward for her duties as Vice President. And what about Bryn , our Race Secretary from way back into the last century? And why do I ask? Well I noted an item which is a “Thank You” to the retiring Editor and an apology due to financially difficult times. Perhaps we should consider such generous long service awards as is considered here! “It is only fitting that when such an ardent worker as S.G. Sherwood lays down the pen, some recognition of his unflagging services should be made. 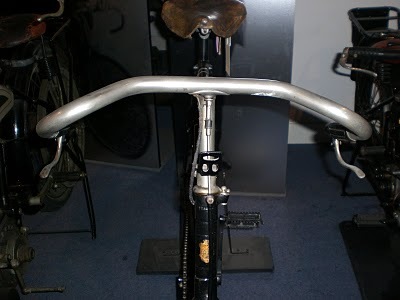 The eloquent S.G.S is unfortunate, inasmuch as he retires at a time when cycling is not an exactly flourishing sport, otherwise he might find himself the possessor of a new bicycle – resplendent in its pristine glory – as a token of the respect of his fellow clubmen. Not for one moment do we suggest that S.G.S needs a new bicycle; far from that, for he rides one of the far – famed East Dulwich products – noted both for speed and symmetry. This reward for zeal, however, does not come to the Editor of the Gazette, he unfortunate wight, toiled for his sins in a secluded spot, far from the madding crowd, preparing copious shafts of wit, satire or learning, as the case may be. It is to be hoped that the Club will not lose S.G.S’s spontaniety but that it may be of very material assistance to our new Editor in carrying on his arduous duties”. I should add for Bryn’s benefit that S.G.S did not retire, but only changed duties. 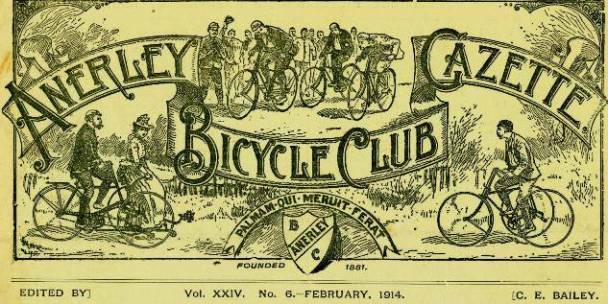 No doubt with thoughts of the pristine glory of a new bike sometime in the future, as he then became Anerley B.C’s Race Secretary! 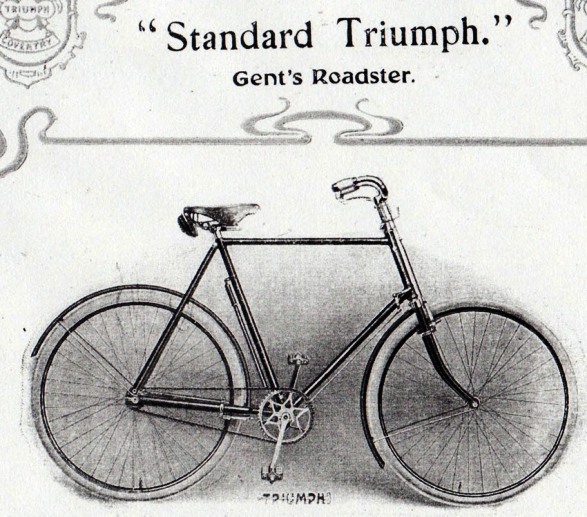 In the terminology current in 1914, Dunney would probably have been classed as a potterer, rather than a scrapper, in which case his awarded bicycle was probably a Triumph Roadster, shown below and priced at the princely sum of £6-14s-9d . Of course S.G.S being a scrapper would be dreaming of this more racy Triumph Royal bicycle, with its dropped bars and costing a lot more, the cheapest model priced at just under £10. Perhaps it was this king sized sum which deterred the Club from awarding him this glitzy machine. This being 1914, it is worth noting that the Triumph company of Coventry was started by a German and the chief designer/engineer was also of German nationality. 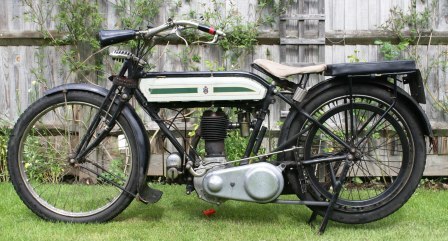 Like many bicycle manufacturers Triumph also made motor cycles but their German roots, did not however deter the British Government from buying 30,000 Triumph motor cycles for use by the British army during WW 1. Their war time Model H, coined as the “Trusty Triumph,” is considered to be the first “modern” motor cycle. 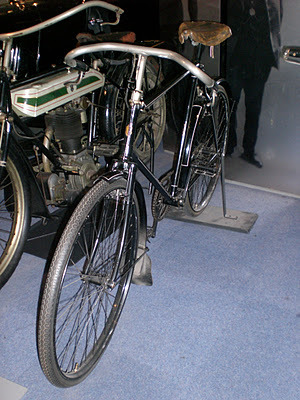 After WW 1 this led Triumph to became Britain’s largest motor bike manufacturer. In 1956 I started work and decided that a motor bike would be more convenient, and a lot cheaper, than bus and train fares on my commute to London. 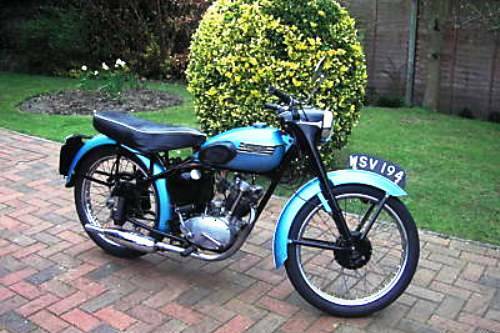 The snazzy metallic blue paint job of the then current Triumph motor bikes caught my young eye. So my Italian racer bicycle with its 10 speed, double clanger, Campagnolo gears, was sold and the money put towards the purchase of a Triumph Tiger Cub. The same model as shown below. From then on I became a biker, rather than a cyclist for the next 30 odd years, only returning to being a cyclist after I retired from work. And just like S.G.S I was not awarded a pristine new bicycle when I retired, but had to buy my own! ← Has the Rain Now Stopped!